The move from Texas might seem quite a leap, but one young family finds its heart’s desire on the coast of Maine. The gallery is visible from the entry hall, which was painted thundercloud gray and leavened with white trim and a vintage modern console table. Homeowner Jared Martin collects antique portraits because he likes interesting faces and the stories they tell. The living room’s cool palette of blues and grays is enlivened with a playful mix of styles and unexpected touches like African-print pillows. Prancing zebras greet guests in the front vestibule. Karu angled the bed in the master bedroom, adding a halo of antique plates above the headboard and a vintage Murano chandelier. Although Heather, a marketing executive, was eager to move to the Pine Tree State, Jared was reluctant to make a commitment. Then, in November 2016, he suffered a heart attack. He was only thirty-eight years old. “I took it as a wake-up call that maybe I needed to change my priorities in life,” he says. 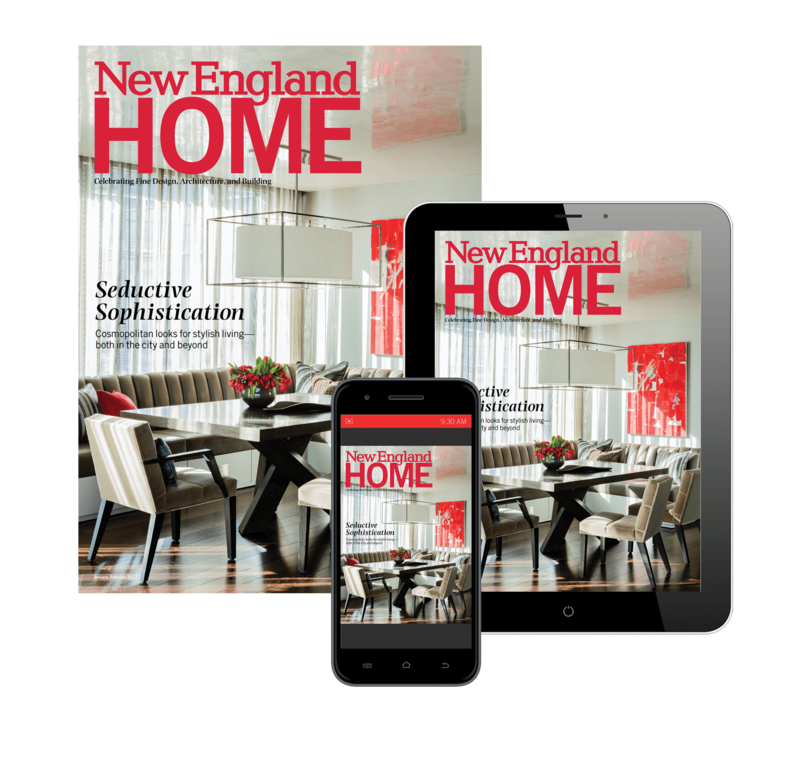 With Heather’s blessing, he approached Falmouth, Maine, interior designer Tyler Karu with a proposition: she could decorate the home as long as he could acquire the furnishings. Although the designer was wary of the arrangement at first, Jared won her over with his savvy shopping and discerning eye. Karu drew up a list of items he should look for, and insisted on seeing images of every piece before he purchased it (in one instance, nixing nearly a hundred choices before giving her approval). “I was very honest if I felt something wasn’t going to work,” acknowledges the designer, who now counts the Martins among her closest friends. While Jared’s main decorating goal was to respect the history of the home, Karu encouraged him to venture outside his comfort zone with finishes and furnishings that would bring the Greek Revival house into the twenty-first century. Because her clients prefer cool colors, she traded the home’s watery pastels for a moody array of blues and grays from Farrow & Ball. (“They do a very good job of mixing colors that are appropriate to old New England homes,” the designer notes.) Jared did all of the painting himself—often while working. “I’m on a lot of conference calls, so I would be talking while rolling,” he recalls with a laugh. Drama of a different sort awaits in the entry hall, where walls the color of a thundercloud instill an air of stark solemnity, relieved by a framed Hermès scarf and fanciful ginger jars arrayed atop a contemporary console table (the item that survived all those vetoes). “We were looking for an unexpected combination of pieces that was appropriate to the style of the house, but didn’t feel too stuffy,” the designer explains. In the living room, which doubles as the family’s TV room, portraits from the eighteenth and nineteenth centuries surround a kid-friendly leather Chesterfield, a sturdy trunk table, and a pair of precious 1830s French bergères (covered in ecru linen, no less). “Our house is not a museum,” Jared says, nonchalantly. “If they survived 150-plus years, I think they’ll handle our children.” To keep the room from feeling too formal, Karu framed the windows with gauzy linen curtains and added throw pillows fashioned from ticking and African Kuba cloth. Jared had always dreamed of having a room that was entirely blue, so Karu chose a majestic Hague Blue for the dining room walls and trim. Once the paint went up, the off-white ceiling felt drab by comparison, so Jared picked up his roller and painted it a sumptuous burnished gold. “It doesn’t read as metallic when you’re in there; it just gives off a kind of glow,” Karu says, approvingly. A gallery wall filled with gilt-framed paintings dominates the sitting area on the other side of the room—part of Karu’s strategy to create a “big moment” in every space. Snowy Shaker cabinets topped with leathered Brazilian granite continue the black-and-white motif, while a 160-year-old Persian rug adds a splash of color underfoot. Although there’s a small table, the family prefers to eat their meals in the dining room, hauling out the Tiffany china and sterling flatware even when there’s barbecue on the menu.